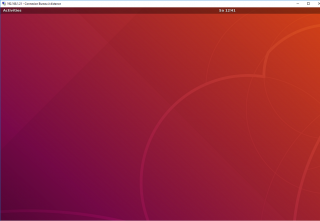 In the previous post, we have performed a simple/standard installation of xRDP using the Ubuntu repository package through our Std-install-xrdp script (version 0.2). 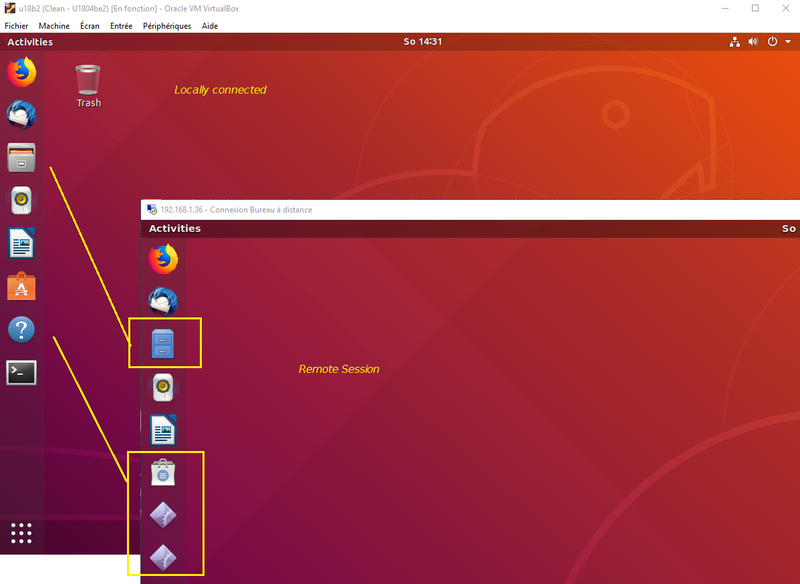 The script streamline the installation and configuration of xrdp on top of Ubuntu 18.04 (at least for the user running the script !!!). 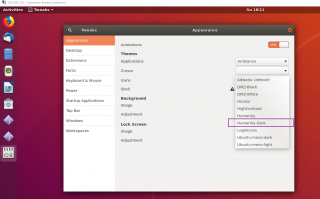 If you perform a manual installation of xRDP (out-of-the-box), the first time you connect remotely, Dock, top bar will not be enabled and the theme is not set to the default Ambiance theme as it should when login locally on the Ubuntu machine. So, without the script, you will then need to perform some manual actions to have a similar look’ n feel in your remote session. 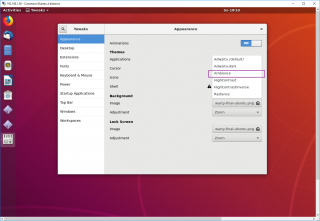 The Std-install-xrdp script (version 0.2) can perform some of the additional configuration actions needed to mimic the local desktop into the Remote session. However, there is a small limitation (which will be adjusted in the Std-Install-xrdp-v0.3.sh script). These additional configuration settings only affect the user that run the script. 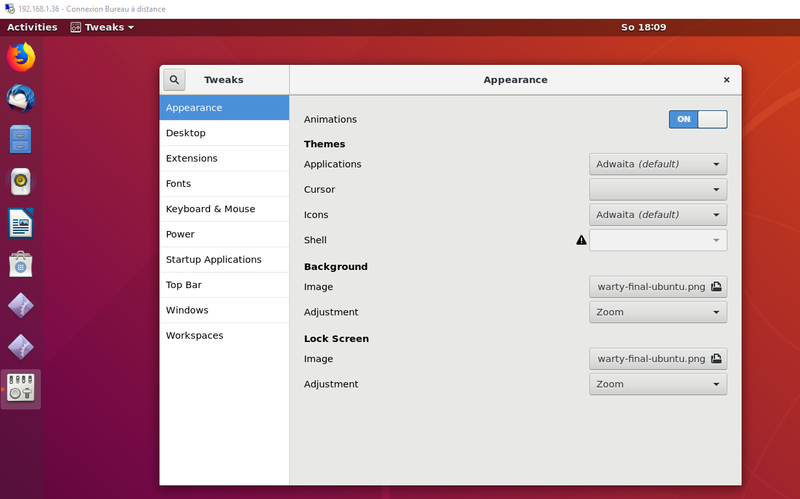 So, if you have a system where multiple users connect via remote desktop, they will see a gnome desktop with no Dock and no Top bar menu. 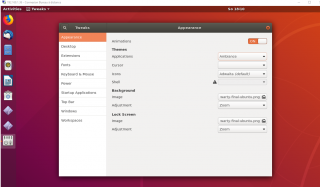 Moreover, the theme will not be set to the default one used by Ubuntu. So, in this post, it’s time to fix this situation. This post will explain what’s the issue we want to tackle and we will explain how to manually solve them. This information will be integrate in the Std-Install-xrdp-v0.3.sh script that will be released shorter after this post…..
For this post, we have make some assumptions. 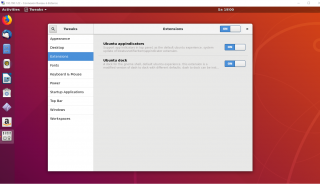 The dock bar and the app Indicator menu extensions are not enabled within the remote session. 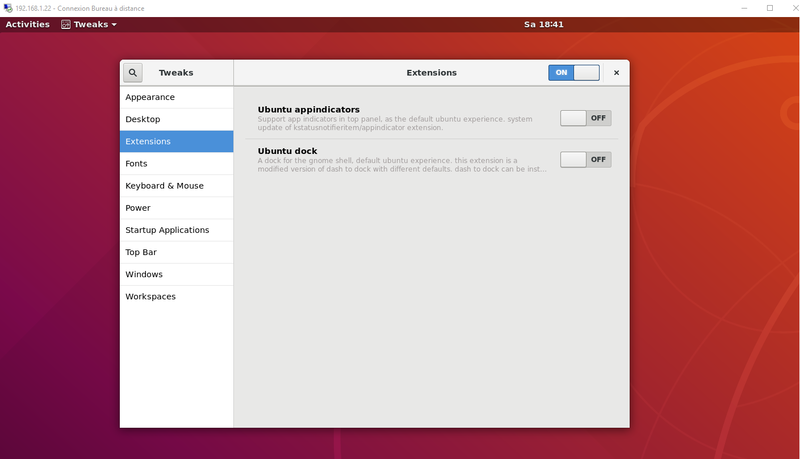 To manually fix this issue (for each user), you will need to install the gnome tweaks tool and enable the different extensions and settings you want to use. Using the Std-Install-xRDP script (version 0.2), these settings can be configured automatically but only for the user that has run the script. 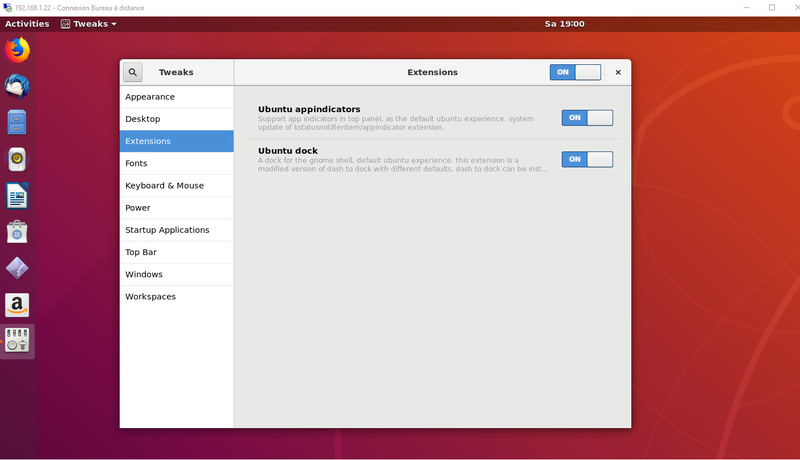 If another user perform a remote connection, the standard Ubuntu Gnome Desktop (no Ubuntu Dock, no App Indicator, no Ambiance theme) will be presented in the remote session….So, Install script needs improvements…. 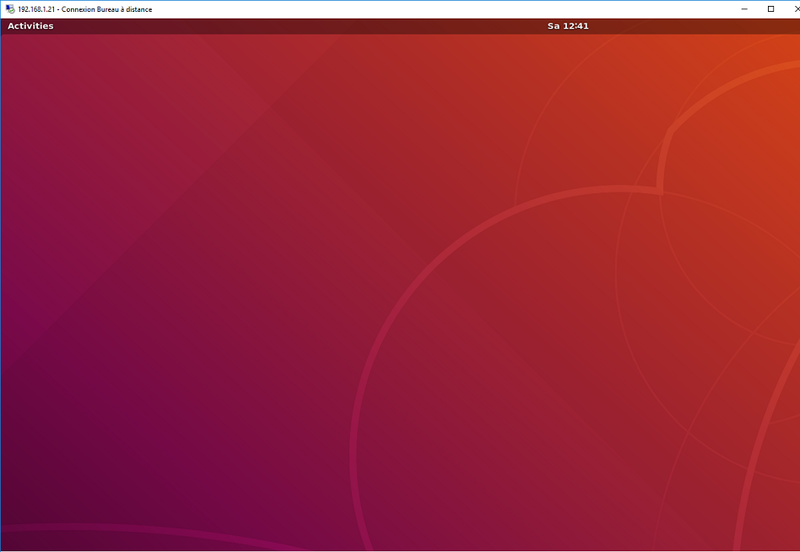 When opening Nautilus in a remote session, you can see immediately the difference. 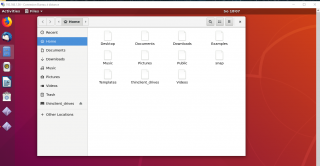 The icon set are all the same (white icons) and the decoration of windows is gray not brown like in the standard Ubuntu theme. To fix this theming issues, it’s really easy. You will be using the Gnome Tweak utility and set the proper theme and icon Set to be used…. 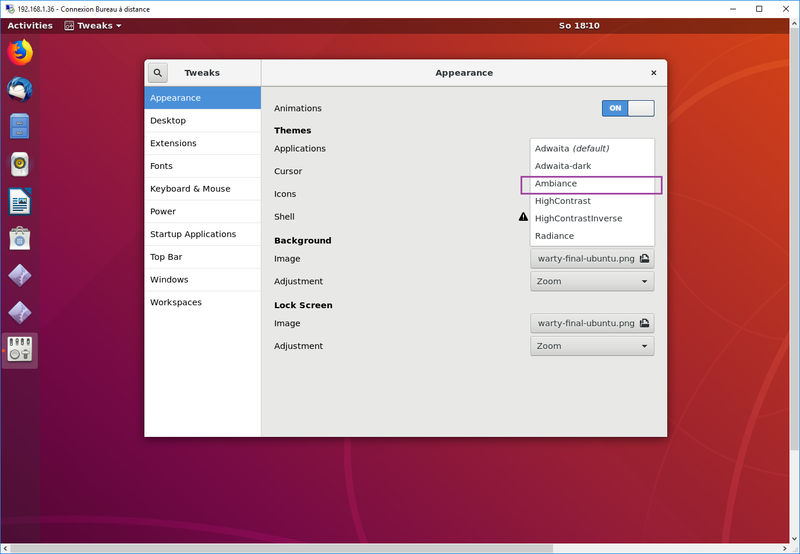 In the screenshot below, you can see that the theme is set to adwaita. 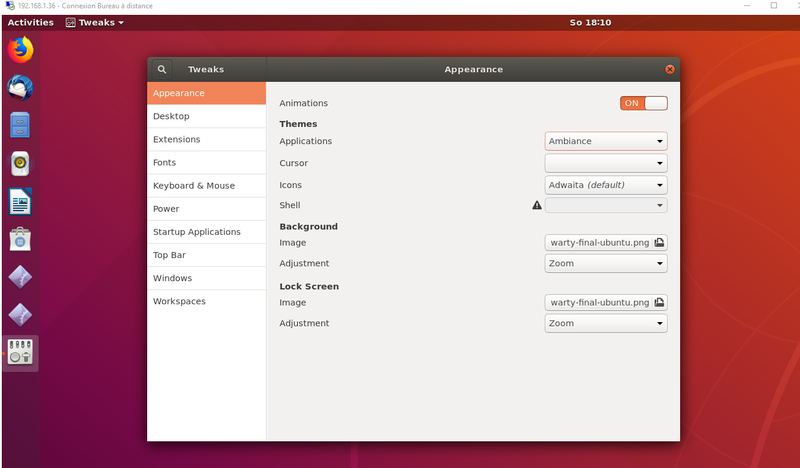 As soon as the option is selected, you should see the new theme applying. However, the icons in the Dock has not changed yet. To change the icons, you have to select also the correct icons set. In the gnome Tweak tool, we have selected the option Humanity or Humanity-dark. You (or the users) will need to perform these changes for each users in their remote session to get the same look’n feel between local sessions and remote sessions. Fixing Look’n Feel issues for all the users….. So, the startwm.sh file should contains the following commands (at the top of the file). 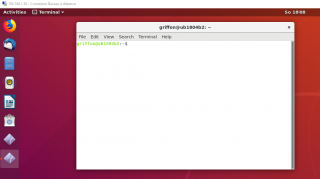 These commands will be executed every time a user remotely connect to the machine…. In a near future, our famous Std-Install-xRDP script will be updated in order to take into account this minor look and feel issues. These issues might be minor but fixing them will provide a better experience to the user which will make them adopt and use the solution more easily. 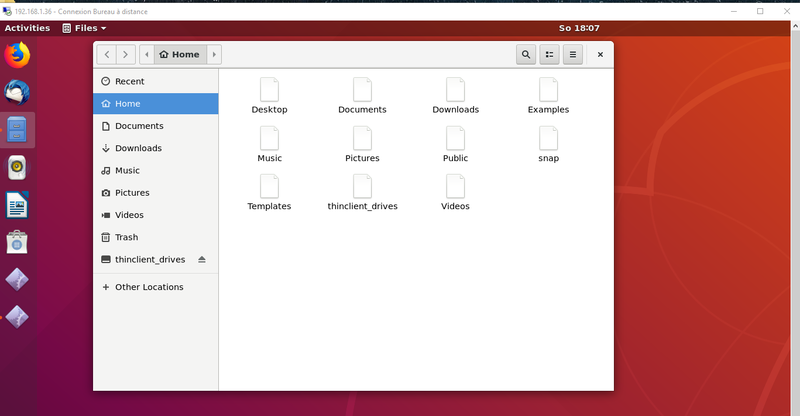 The script might (maybe or maybe not) might provide a more flexible solution for fixing the theme issue and might be able to take into account users preferences…. We will see if we have enough time to work on this…..
That’s it for this post ! As you can see, we have recently taken actions to tackle the most common issues and annoyances that can occur when using xRDP. 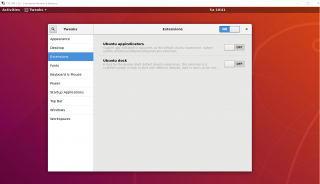 In a previous post, we have see how to fix (correctly) the issue related to the annoying popup asking permissions to create managed devices. In another one, we have tried to fix the crash popup when login into the machine…With this post, we have tackled the look’n feel issues as well. There is still a small look n feel issue that we would like to tackle.. The different lock screens in remote sessions and local sessions.. If we have enough time, we will try to tackle this issue as well but might be a little bit more complicated than changing themes and enabling extensions….